Over the years, Square Enix has become synonymous with role-playing games. For many fans, the SNES era hit a sweet spot with classic RPGs like Final Fantasy, Secret of Mana, and Chrono Trigger. The company has continued to develop nostalgic throwbacks, like Bravely Default and Lost Sphear, so it was no surprise when it initially unveiled Octopath Traveler during the first major Nintendo Switch presentation the last year. The brief reveal trailer was like nothing I’d seen before, yet it felt so familiar. 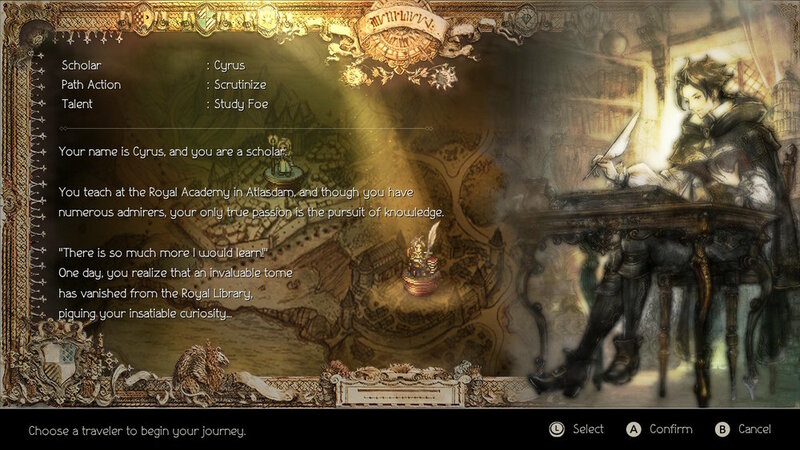 After finally playing through Octopath Traveler, I realized why. It evokes the classic era through modern takes on retro game design – striking visuals that marry 2D and 3D, truly daring storytelling, and a deep, engaging battle system. The retro influence is most evident in the game’s presentation. 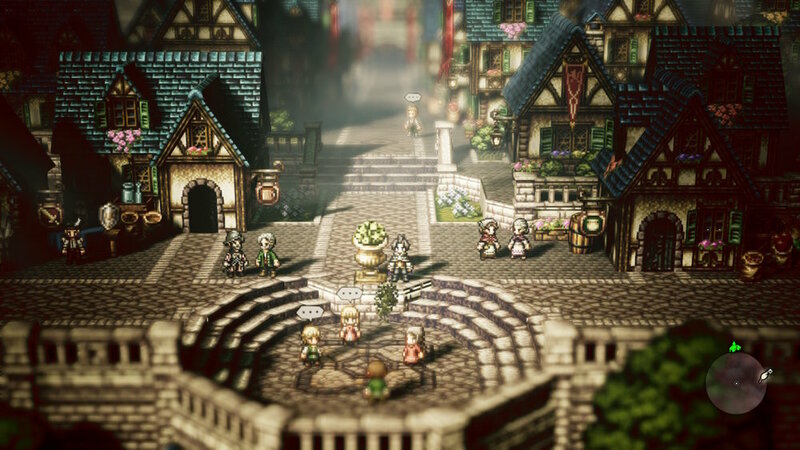 Octopath Traveler features 2D 16-bit sprites superimposed on a 3D background, resulting in a unique pop-up book visual style dubbed “HD 2D.” Gorgeous lighting and blur effects transform the colorful world into stunning set pieces. It’s amazing that the designers essentially slapped retro assets onto a diorama and somehow created something so aesthetically pleasing. I’m just as amazed by the magnificent orchestral score, with both exciting battle themes as well as slower, thoughtful pieces that hearken back to classic medieval and Celtic soundtracks. Additionally, the impressive English voice acting sells every character perfectly without feeling too forced, which is important considering the sprites’ limited expressions. Octopath Traveler tells the story of eight travelers on their separate journeys across a vast world. More accurately, the game portrays eight distinct stories, each an isolated vignette starring one of the protagonists. Unlike other RPGs that feature one main hero and a merry band of sidekicks, Octopath Traveler puts equal weight on each person. Everyone has their own four-chapter arc that shares their personal adventure from beginning to end. Although the travelers all eventually join up, they don’t play a visible part in each other’s stories and don’t even formally show up in one another’s cutscenes. It’s a risky form of storytelling that may alienate some who are used to a party with a shared goal. Instead, however, there are eight absolutely moving stories with genuinely endearing protagonists. I prefer character-driven plots, and Octopath Traveler effectively details everyone’s plights to an even greater degree than in some other standard RPGs. The twists may be a bit predictable, but the deep, engrossing storylines led me to adore each party member. They all have personal reasons for adventuring, like searching for a murderer, hunting a legendary beast, or seeking the meaning of one’s life. Every story dives into their inner struggles with mature arcs highlighting ethical dilemmas, self-sacrifice, and scholarly debates. Needless to say, I fell in love with the strong cast. I only wish that there was more natural character interaction. The limited party banter skits, while enjoyable, only give a glimpse of their camaraderie. Although there are some unified sections, mainly buried under sidequests, they’re not as elegantly implemented as the individual anecdotes. Octopath Traveler handles its unorthodox structure with nonlinear gameplay. At the beginning, you choose any of the eight wayfarers as your starter character, who must stay in your party until you complete his or her storyline. Each of a character’s four chapters has a similar structure: exposition, followed by a dungeon, culminating in a boss. After you complete your protagonist’s initial episode, you are free to recruit any of the other seven party members, explore the lands and optional dungeons, or even attempt their second chapter – likely a difficult feat. The game has an open-world nature; you can proceed as you wish, and your only barriers are your level and skill in facing stronger enemies. That said, the map is designed to lead you across predetermined pathways to ensure balanced teams, which are needed not just for battles, but also in the overworld. Every character has special talents, such as the merchant’s ability to purchase items from NPCs or the thief’s preferred method of stealing from them. I appreciated the NPC interaction, which played heavily into the game’s numerous sidequests. Each one has multiple solutions, depending on how you approach them. For example, scrutinizing a villager for information may result in a different outcome than alluring an individual. Encounters are random, which may disappoint some. I never minded getting into fights, though, since that’s where the gameplay truly shines. Battles are turn-based, and a handy display shows when each person or creature will perform their action, whether attacking, defending, or using an exclusive ability. For instance, the hunter can capture and summon creatures for a Pokémon-like feel. Some characters are easier to use than others, but I overall felt comfortable no matter who was in my party. Combat sounds old-school, but two elements make fights stand out. First, you can exploit weaknesses by using specific weapons or magic, or rather, you must target enemy weaknesses to whittle their defenses. When hit enough times, an enemy will break, which allows you to skip their turn and strike for extra damage. Second, you can expend up to three boost points to power-up, accompanied by excited yells and a glowing aura, Dragon Ball Z style. Consequently, you can perform multiple standard weapon attacks in succession or quadruple the potency of your spells and special abilities. There’s a risk/reward element; whenever you use boosts, you won’t gain any boost points the next turn. But if you time your buffs right, it’s especially satisfying to destroy a broken enemy with a fully boosted attack. These deep mechanics kept every fight exhilarating, with the titanic bosses delivering pure strategic bliss. Character progression is just as enjoyably layered. The eight travelers have defined roles, such as cleric or apothecary. Winning battles not only nets you experience and money, but also job points, which you can spend on battle skills, such as elemental magic or buffs. As you unlock them, you also earn passive skills that offer great bonuses. It becomes gratifyingly deep once you can set subclasses. Want a mage with strong ax attacks or a warrior with healing powers? You are free to make the team your own, mixing and matching classes and skills to find what works. It hearkens back to the best job systems from Final Fantasy and Dragon Quest series and is just as fun to experiment with. The clean, easily navigable menus streamline the process. This massive game may take anywhere between 50-70 hours just to finish everyone’s stories, though there are also additional sidequests, optional areas, and postgame content, which may be worth pursuing. Although the difficulty scales based on progress, I rarely needed to grind, unless I hadn’t been using a character much. For those who shudder at lengthy games, the developers address this with the chapter system. Each chapter is about an hour or two, so you can efficiently chunk them in your spare time, which fits the portable nature of the Switch. Octopath Traveler lovingly embraces old-school RPG conventions while offering its own refreshingly modern take. Through placing sprites in 3D environments, incorporating a separate storyline for each party member, and spicing up battles with fist-pumping turn-based combat, Square Enix makes bold choices to reinvigorate the genre. Thankfully, many of them pay off, resulting in a game that has tugged at my heartstrings and fully engaged me to follow the paths of these eight wayfaring travelers. Dragon Quest Builders is an engaging sandbox craft game that appeals to players who desire a more structured Minecraft campaign. Mario + Rabbids Kingdom Battle was a surprisingly fun strategy game that blended the Mushroom Kingdom with Ubisoft’s raving Rabbids. Less than a year after its initial release, the game has returned with the new DLC expansion Donkey Kong Adventure, introducing Nintendo’s beloved ape into the fray.